An easy and effective way for your customers to contact you. Optus 13,1300 or 1800 services allow callers to phone your organisation using a single national number at the cost of a local call, or at no charge at all. Routing and call handling solutions enable the calls to be handled efficiently. With Optus National Inbound solutions you can extend your business reach and enhance customer service, while giving you control over when and where you answer calls. 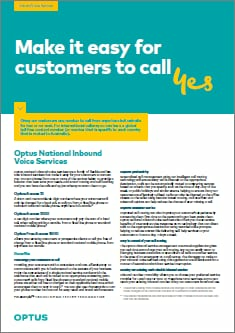 Here's a quick way that you can find out how Optus Business Inbound Voice services can enhance your customer's experience with you. 13, 1300 and 1800 numbers - From a fixed line phone or standard national mobile phone anywhere in Australia your customers can reach you easily and inexpensively on a local rate 13 or 1300 number or freephone 1800 number (13 and 1300 calls from mobiles are charged at their applicable carrier rates charged at no more than the cost of a standard mobile national call). Intelligent call routing - With our intelligent routing technology customer calls will be directed to the right destination based on criteria that you specify, such as the callers location (Zone Routing), or the time and day of the call, or you can route calls to voicemail. SMS contact - SMS to 13 gives you the ability to receive SMS as well as voice on your13/1300/1800. 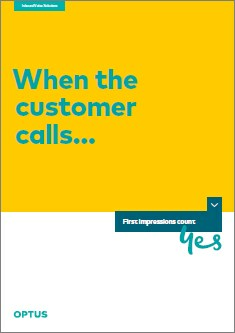 Your customers can request more information or a call back by simply sending an SMS, and you receive opted-in contact details of prospective consumers (for use in relation to your particular offer). For more complex business requirements additional Customer interaction solutions and Customer experience solutions are available. You can also extend your reach with Optus International Inbound Services. Business growth and customer loyalty - When you give your customers and prospect an easy, inexpensive way to get in touch you're more likely to attract their business. Better investment with network based solutions - Scaleable network based solutions allow you to grow your business without investing in capital equipment for applications such as Interactive Voice Response. Improve your business efficiency - Our flexible call routing features allow you to send calls to the right locations for the calls to be answered. Measureable and appealing engagement for your customers - SMS to 13 is a quick, easy and economical way for customers to engage with your organisation, and offers you the ability to determine which media a customer has responded to. Rapidly adapt to changes - With our flexible services and online service management tools you are always in control of when, where and how calls are answered, and you can rapidly adjust if your business or call volumes change. Two packages are available to get you started quickly and easily at the level required by your business. The standard package includes the more widely used inbound call routing features. The advanced package adds more features to allow you to intelligently identify calls and then direct them more efficiently. We can also tailor an individual package for you. Assistance is always available when you need it. Our service desk operates 24 x 7 for you to report faults or request emergency diversion. Self service tool Optus Inbound Service Management is also available for control and reporting of your Optus inbound services. For more details about these packages download Optus Inbound Services Pricing Options. Phonewords turn your inbound number in a word for easy recall and customer call-to-action. Your phonewords can consist of either a 1800, 13 or 1300 number and up to six or four letters respectively. For example 1800CINEMA 13HIRE OR 1300DOCTOR (These are examples only and may not be available). Similar to a 13 number, except it is a 10-digit number, with a 1300 prefix. The caller from a fixed line phone or standard national mobile phone pays for a local call while you pay timed call charges. Mobile callers will be charged at a rate depending on their mobile plan charged at no more than the cost of a standard mobile national call. A 1800 number is an automatic national reverse charge service. This means it's free to the caller from a fixed line phone or mobile phone, and you pay timed call charges. A 13 number is a short, memorable 6-digit number. The caller from a fixed line phone or standard national mobile phone pays for a local call while you pay timed call charges. Mobile callers will be charged at a rate depending on their mobile plan charged at no more than the cost of a standard mobile national call.